Once you realize your small community will experience development pressure from a suddenly not-so-distant major city, how do you respond? Do you fight the growth, hoping to pass it on to the next town? Or are you proactive, preparing for new development and harnessing it to make a positive change for residents both new and old? Newton County, Georgia, 30 miles east of Atlanta, struggled with these choices in the early 2000s. For years, Newton County reigned as the eighth fastest growing county in the United States. Its population doubled, surpassing even its more urban neighbors. When new schools opened each year, they opened with classroom trailers to handle the swelling student population. An increasingly long rush hour forced traffic to a standstill on miles of two-lane country roads. A handful of residents wanted to be proactive, but they didn’t quite know how. So they began asking questions, talking to people, and looking for examples of communities that grew intentionally. 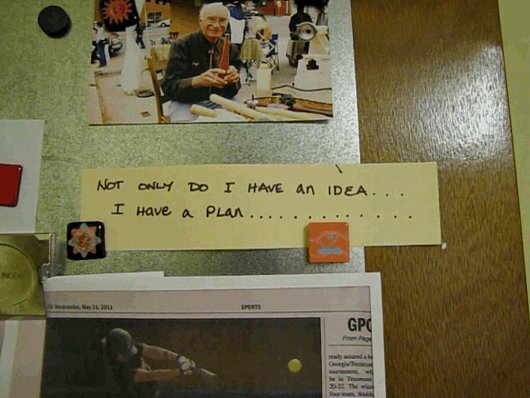 They developed a three-step strategy: a place, a process, and a plan. This is the first in a four-post series that tells their story. For example, how much must a new home cost for the city to break even between property taxes and expenditures on services? 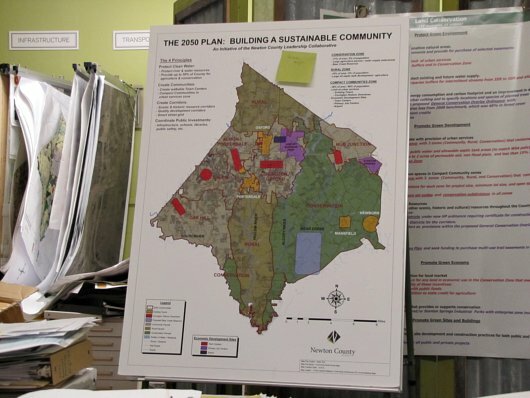 Conveniently, Andres Duany of Duany Platner-Zyberk came to town to lead a charrette on the City of Covington’s Downtown District. For many people, this was the first time anyone asked them to consider the future look and feel of their community. They liked it. Some people began to ask why the county and its cities didn’t use process more often. As people began finding value in the study of growth and its impacts, a regular group of elected and appointed officials began to form. This group became known as the Leadership Collaborative. Its members include appointed and elected officials from the county government, governments of the five cities within Newton County, the School Board, the Water and Sewer Authority, and the Chamber of Commerce. Over years, the Leadership Collaborative and its committees developed an aggressive growth management strategy. Directing growth into five new planned compact communities will put 88% of the future population on 30% of the county’s land. These communities will be walkable, with neighborhood schools and a mixture of uses. The open space and working farms on the rest of the county would be preserved for future generations. 1. How did the Leadership Collaborative develop its 2050 Comprehensive Plan, and how did students play such a large role? 2. Why have elected officials and agencies remained committed over the last decade, and how are new representatives incorporated into the process? 3. After years as one of the fastest growing counties in the U.S., Newton County now leads in foreclosures. Now that the development pressure is off, how is the county adjusting and maintaining its process? Ruth Miller is a masters student in the UC Berkeley Department of City and Regional Planning. She grew up in Newton County, Georgia, received her undergraduate degree from the MIT Department of Urban Studies and Planning in 2007, and remains engaged with the Newton County Center for Community Preservation and Planning. This is so interesting. 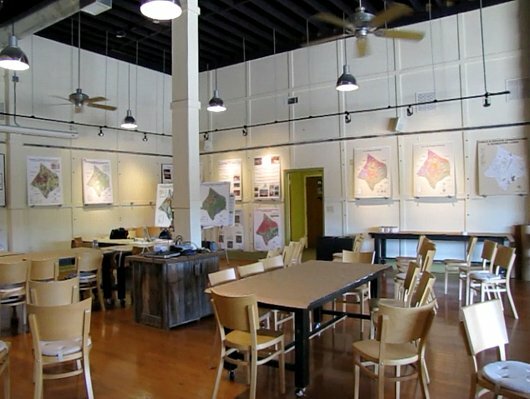 It seems so easy: A center for community planning, where anyone can walk in and learn about what’s happening and participate in workshops. I’m wondering how this model might work in cities and towns with different problems. What would such a center mean in a post-disaster town? Or in a town that’s losing population rather than gaining it? I wonder if there is something about the nature of a population explosion and building boom that makes this idea work. I like to think the idea of starting conversations can work anywhere, on any topic. The big problem in Newton County was that no one was talking. No one had to assign them a topic at the first meeting – they knew what was on their mind, and they figured out where to go from there on their own. I am a big advocate for smart growth and limited development. Zoning is your best tool after an informed citizenry. I live in rural Wisconsin and appreciate some of the creative measures taken in my area to limit subdivisioning land and the loss of our agricultural heritage. I am also pleased by how industrial farming has been contained.